When heroes choose to chase down the fiendish, spooky, and downright villainous, Pathfinder Flip-Mat: Wicked Dungeon has you covered. Each side of this Flip-Mat details a different haunt for the purely wicked: one is a twisted labyrinth of briar walls, and the other is a hellscape prison of magnma, smoke, and burning iron. This portable map measures 24"x30" unfolded and 8"x10" folded. Designed for experienced GMs and novices alike, and usable with both dry erase and wet erase makers, Pathfinder Flip-Mats fit perfectly into any Game Master's arsenal! Don't waste your time sketching when you could be playing. 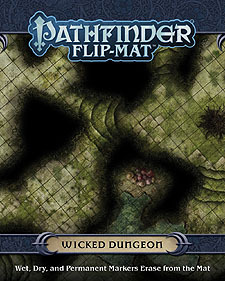 With Pathfinder Fip-Mat: Wicked Dungeon, you'll be ready the next time your players want to face down frighteningly horrid foes.